So far in this blog series memory optimised tables have been created with the durability option of SCHEMA_ONLY meaning that data will not be retained. However there is another durability option of SCHEMA_AND_DATA which means that SQL will retain data held in memory optimised tables. But how is this achieved? Well, this is done via the transaction log (the same as with disk based tables) and checkpoint file pairs which are written to by the checkpoint process. It is these CFPs that I want to go through in this post. The purpose of the checkpoint operation in SQL is to reduce recovery time by hardening to disk data pages that have been altered in memory (i.e.- “dirty” pages) and as such SQL will not have to apply the corresponding redo operations from the transaction log in the event of a crash. 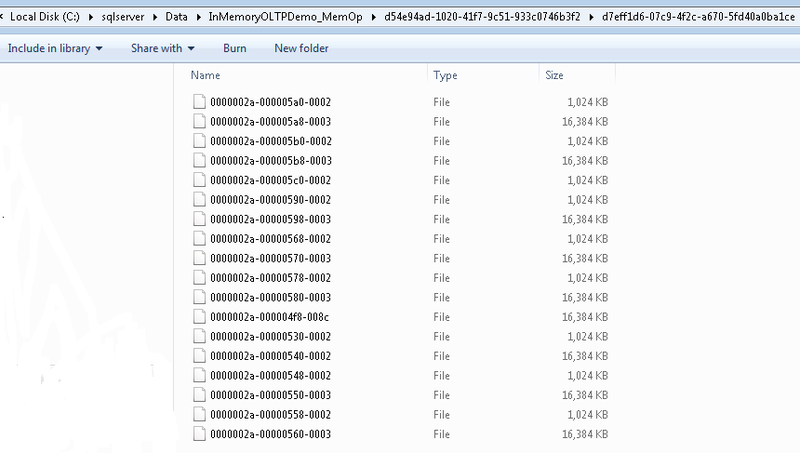 However even though the purpose is the same for both disk based and memory optimised tables the process is different. For memory optimised tables the checkpoint process is continuous and utilises the previously mentioned checkpoint file pairs (CFPs). These are the physical CFPs, 18 files in total, 9 pairs. Here we can see the 9 file pairs, most of which are ready for use by being marked as PRECREATED and one pair currently ready to have records written to them by being marked as UNDER CONSTRUCTION. The previous files marked as “Under Construction” are now “Active”. This is the continuous checkpoint process in action, changes are written to the CFPs as they occur. When a CHECKPOINT command is issued (either by SQL or by the user manually) the current CFPs marked as UNDER CONSTRUCTION are then marked as ACTIVE. No more records will be written to the data file, although records can still be written to the delta (to mark records in the data file as deleted). N.B.- You should never do this on a production system, the garbage process is automatic but hey, this is a demo. This means that two CFP files which were marked as TOMBSTONE have been removed. Just a final word on how the CFPs are used in the recovery process. If (when???) 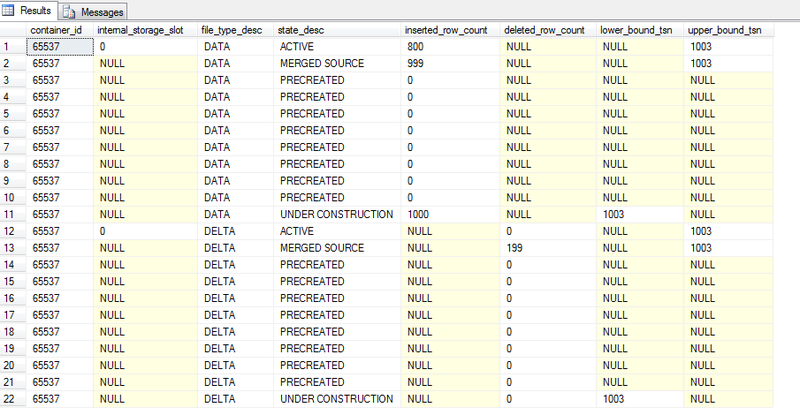 SQL crashes, the data and delta files are used to re-populate all memory optimised tables. The files are scanned and loaded into memory, all active rows in the data file are inserted after removal of rows in the delta file. Due to the pairing of the data & delta files the recovery process can be parallelised with multiple threads reading each pair. Once the load is complete the tail of the log is replayed to bring the database back to its state before the crash (as normal). I hope that’s been a good overview of checkpoint file pairs for memory optimised tables. Thanks for reading!